And now for my thoughts on Orly Love Collection: NOT IMPRESSED. Generally, the colors have ok application, not streaky but almost none of the colors were flattering. Most of the colors are translucent at 2 coats, so if you’re like me and don’t like translucent colors, you’d need to use 4+ coats to get bottle color – but 4 coats = bubble hell. On my eternal search for wearable off-whites, I had high hopes for Orly My Beau. It’s a white eggshell type color. It’s not unattractive per se but the yellow tones in it looked weird with my skin tone. This swatch is 4 coats, you can’t see the bubbles in the picture but I assure you that they are there. At two coats, Orly Dream Boat would probably be a good french mani color. This swatch is 4 coats, same issues with bubbles. And again, it’s just not flattering for my skin tone. Someone on MUA compared Orly Secret Admirer to a creamsicle, that’s the perfect description for this color. This swatch is 4 coats. Again, this collection just really wasn’t meant for people with my skin color. Orly First Kiss was one of the fan favorites from this collection. It’s the only color from the Love Collection that I’ve worn as a mani. Again, the color, that I describe as a ‘dead’ pink for it’s lack of luster, did nothing for my skin tone. I wore it for 3 days and it still did grow on me. I have seen people with lighter skin tones wear it very well but there are better light pinks out there for us darker girls. Using only two coats, it would probably work better for french manis, but why bother when you can get Essie Mademoiselle instead. I actually don’t have anything negative to say about Orly Crush on You. It’s a great orange with great application, this swatch is 2 thick coats. Orly Butterflies and Orly Crush on You are the two stand out colors from this collection. Butterflies had great application, the swatch is 2 thick coats. 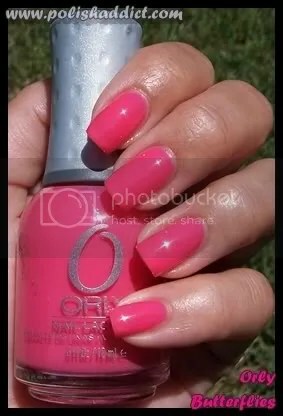 This hot pink is very vivid – both Butterflies and Crush on You are great colors for summer and spring. thanks for the swatches! I’m so jealous of your nails and hands! Wow, I really like all of those. I didn’t think I would. Your nails are soooo gorgeous! Your nails are beautiful! Orly Frist Kiss was the only one I bothered with in this collection, I agree that it was a bit disapointing overall. Great blog, btw-can’t wait for your next entry! I so missed my Polish Addict!! I’ve heard that Butterflies looks like OPI Strawberry margarita. What are you thoughts? No I don’t think they’re similar. Butterflies is brighter, SM is more muted. 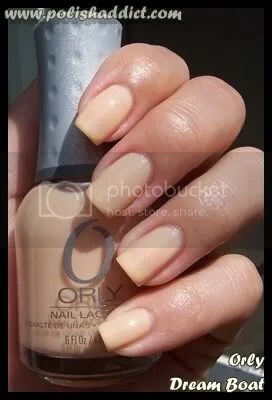 Is Crush on You a creme version of Orly Heat Wave? That’s what I seem to be seeing, although perhaps Heat Wave is a bit brighter. I don’t have heat wave but based on the pics I’ve seen, I’d say they aren’t similar. Heat Wave definitely looks brighter.